A 360 approach to comprehensive background checks, giving you the insights to make the right decision. 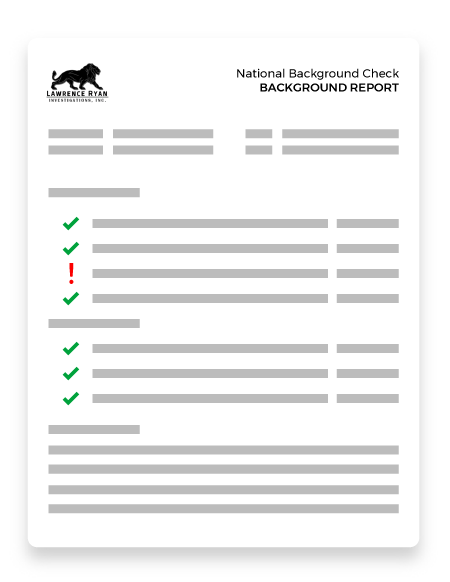 What is a Advanced Background Check? Advanced background checks and a complete criminal history report serve as invaluable tools for verifying an individual’s personal, professional, and financial history and current status. All comprehensive reports are not created equally, though. You must choose a firm that thoroughly searches both public and private information sources. LRI utilizes a strategy that draws from multiple top-tier data sources to provide a comprehensive and accurate profile of the subject that our clients rely on to make important business and personal decisions. How can Background Checks be used? Can’t I use a Free Online Background Check? Yes. You can use a free online criminal background check but you will find these reports will only give you limited data. Typically not enough data to help make an informed decision. Look yourself up and you will see that many times the information is inaccurate, dated, or incomplete. More importantly you will find it is limited. Most of the free online background checks are simply databases that have scraped data off of public facing websites, which can return incomplete and inaccurate information. What can a Advanced Background Report identify? Each day, LRI is helping clients uncover the truth behind entities and individuals. How LRI’s Background Checks Services Different? Our licensed asset investigators not only use the largest network of data sources in our searches to get public criminal records and data, but also perform manual searches that allow us to give a higher level of certainty than typical data mining services.